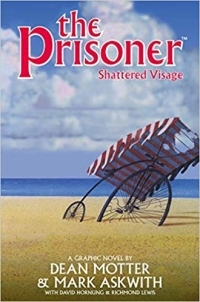 In the 50+ years since The Prisoner series was created, there have been many books written about the series. Some good, some bad, some big, some small, but never before has there been a definitive list of all the published books about the series. Until now. The following list is a quick-reference guide for those interested in acquiring a particular book, or for those wanting an overall idea of the amount of printed work that is available. Title, author, publisher name, ISBN, details, and links to reviews and purchasing are included. To be included, the title must be a book (not a magazine or fanzine), and at least one third of the content must be related to The Prisoner in some way (so general TV or telefantasy books which include only a chapter about the series are not included). 1. Titles in bold have been published by a recognised publisher as recognised by Nielsen Book Data, or by an official source. 2. Where there is no ISBN for this book, and it has been self-published, the entry will not be in bold, and ISBN section will be marked s/p (self-published). 3. *** denotes that the unauthorised use of copyright material is included in the book (photos, copyrighted-characters, etc are used without permission from the relevent copyright holders) so is to be regarded as unauthorised/fan/amateur material. 4. pp - No. of pages. 2019 Into The Village Roger Langley Escape s/p *** Unlicensed fan-penned novel based on the series. 2018 The Prisoner Dusted Down David Stimpson Quoit Media 9781911537090 Personal examination of the series 496pp. 2018 The Prisoner Interrogations 2 Leslie Glen St Inan's Press 9780956792815 2nd volume of quiz book based on the series, set out in examination format. 2018 One Likes to Know Everything Ed. Ed Fordham Blurb 9781388147730 B&W edition of collection of fan-written articles from the previous 30 years. 2018 One Likes to Know Everything Ed. Ed Fordham Blurb 9781388147143 Colour edition of collection of fan-written articles from the previous 30 years. 2018 The Prisoner - Une Mythologie Moderne Jean-Michel Philibert s/p 9782956599302 French examination of the series. 2018 Je Ne Suis Pas Un numero! Patrick Ducher BookElis 9791022772679 French collection of Patrick McGoohan quotes. 2018 Patrick McGoohan Michael Senna Editions du Bisse French biography of Patrick McGoohan. 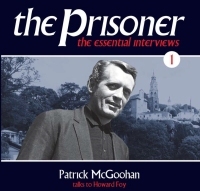 2018 The Prisoner - The Essential Interviews 1 (Audio Book) Howard Foy Quoit Media 9781911537083 CD of 1990 Patrick McGoohan interview. 2018 The Prisoner - Original Art Edition Jack Kirby and Various Titan 9781785862878 Treasury of unfinished Marvel comics from late 1970s. 2017 Miss Freedom Andrew Cartmel Powys Media 9781387177998 Reprint of novel (below). 2017 I am Not a Number - Decoding The Prisoner Alex Cox Kamera 9780857301758 Analysis of episode content to decipher the series. 2017 The Prisoner - Series 2 (Audio Books) Nicholas Briggs Big Finish 9781785753671 Audio book re-imagining of The Prisoner (series 2). 2017 The Prisoner - An Illustrated History Andrew Pixley Network 9780992976620 Production guide with full colour photos. 2017 The Prisoner - The Essential Guide Rick Davy Quoit Media 9781911537052 Colour factual guide to the series with prev. unseen photos. 2017 The Prisoner - It Means What it Says Volume 1 Ed. Ed Fordham Amazon Kindle Publishing 9781549586248 Colour edition of collection of fan-written articles from the previous 30 years. 2017 The Prisoner - It Means What it Says Volume 1 Ed. Ed Fordham Amazon Kindle Publishing 9781549572395 Standard edition of collection of fan-written articles from the previous 30 years. 2017 Danger Man or Prisoner? Roger Langley Escape s/p*** Self-published/updated version of McGoohan biography (below). 2017 Unique But Similar - The Prisoner Compared Andrew Shenton Miwk 9781908630810 Updated/expanded edition of comparison book (below). 2017 Everyman - A Celebration of Patrick McGoohan and The Prisoner Brian Gorman Quoit Media 9781911537045 Audio book/drama edition of graphic novel (below). 2017 Everyman - A Celebration of Patrick McGoohan and The Prisoner Brian Gorman Invisible Six 9780995521810 Updated version of graphic novel story (below). 2016 Project Prisoner - The Village Technical Manual Tim Palgut Tally Ho Publishings s/p Self-published updated Village Files book (below). 2016 Cutting Edge - My Life in Film and Television Eric Mival Quoit Media 9781911537021 Hardback autobiography of The Prisoner music editor and life-long McGoohan friend. 2016 Cutting Edge - My Life in Film and Television Eric Mival Quoit Media 9781911537007 Paperback autobiography of The Prisoner music editor and life-long McGoohan friend. 2016 50 Years of The Prisoner Roger Langley Escape s/p *** Incomplete resume of happenings since 1967. 2015 The Prisoner - Series 1 (Audio Books) Nicholas Briggs Big Finish 9781781785614 Audio book/drama re-imagining of The Prisoner (series 1). 2015 The Prisoner Handbook - An Unauthorised Companion Steven Paul Davies PAN 9781509821006 Print on demand re-print edition of handbook, below. 2015 Everyman - The Story of Patrick McGoohan - The Prisoner Brian Gorman FBS Publishing Graphic novel story of McGoohan's life and creation of The Prisoner. 2014 George Markstein and The Prisoner Ed. Roger Goodman PandQMedia 9780992905408 Hardback book about The Prisoner's script editor. 2014 George Markstein and The Prisoner Ed. Roger Goodman PandQMedia 9780992905415 Paperback book about The Prisoner's script editor. 2014 The Prisoner Who's Who? Roger Langley Escape s/p*** Paperback booklet of the series' numbered characters. 2014 The Prisoner Dialogue Decodes Roger Langley Escape s/p*** Paperback booklet analysing the series' dialogue. 2014 Unique But Similar - The Prisoner Compared Andrew Shenton Indepenpress 9781780036199 Comparison of other TV and films to The Prisoner. 2013 Le Prisonnier - Sommes-nous tous des numeros Pierre Serisier France Uni Press French analysis of the series. 2013 The Prisoner Located Roger Langley Escape s/p*** Collection of screengrabs of sets and locations seen in The Prisoner. 2012 The Prisoner Interrogations Leslie Glen St Inan's Press 9780956792808 Quiz book based on the series, set out in examination format. 2011 Not a Number - Patrick McGoohan - A life Rupert Booth Supernova 9780956632920 Biography of Patrick McGoohan. 2010 The Prisoner from The Inside Roger Langley Escape s/p*** Plots, scripts, and background into The Prisoner (first seen as magazine articles). 2010 The Making of The Prisoner Roger Langley Escape s/p*** Reprint of 'The Prisoner in Portmeirion' (below). 2009 The Prisoner 1 Thomas M Disch Penguin USA US reprint of novel (below). 2009 The Prisoner 1 Thomas M Disch Penguin 9780141049403 Reprint of novel (below). 2009 Le Prisonnier - Une Enigme Televisuelle Patrick Ducher & Jean-Michel Phillibert Editions Yris Updated edition of French language series guide. 2009 Portmeirion in The Prisoner and its history Roger Langley Escape s/p*** Booklet of history of Portmeirion and its role in The Prisoner. 2008 Miss Freedom Andrew Cartmel Powys Media 09677288096 PM2008 reprint of novel (below). 2008 Prisoner Trilogy Roger Langley Escape s/p*** Compilation of three unlicensed novels (below). 2008 Miss Freedom Andrew Cartmel Powys Media Novel based on the series. 2007 Danger Man or Prisoner? Roger Langley Tomahawk 9780953192649 Biography of Patrick McGoohan. 2007 The Prisoner - A Complete Production Guide Andrew Pixley Network Full production guide to the series. 2007 The Prisoner Handbook - An Unauthorised Companion Steven Paul Davies Macmillan 9780230530287 Reprint of Handbook (below). 2007 Fall Out Fiona Moore & Alan Stevens Telos 9781845838621 Book looking into the meanings of the series. 2006 The Prisoner - The Original Scripts Volume 2 Ed. Robert Fairclough Reynolds & Hearn 9781903111819 2nd volume of finished and unmade scripts. 2005 The Prisoner - The Original Scripts Volume 1 Ed. Robert Fairclough Reynolds & Hearn 9781903111765 Original scripts of finished and unmade episodes. 2005 The Prisoner Series Guide Roger Langley Escape s/p Episode guide to The Prisoner. 2005 The Prisoner's Dilemma Jonatahan Blum & Rupert Booth Powys Media 9780967728056 Novel based on The Prisoner. 2003 Le Prisonnier - Une Enigme Televisuelle Patrick Ducher & Jean-Michel Phillibert Editions Yris French language series guide. 2003 The Prisoner Variations David Stimpson Reunis Books 0954552709 Collection of self-penned short stories. 2003 The Prisoner - The Village Files Tim Palgut Titan 9781840235975 Book of cross sections and diagrams of the world of the Village. 2003 The Prisoner 3 Hank Stine iBooks Reprint of novel (below). 2003 The Prisoner 1 Thomas M Disch iBooks Reprint of novel (below). 2002 Les Archives du Numero 6 Patrick Ducher Le Rodeur s/p French guide to Prisoner books and merchandise. 2002 The Prisoner Handbook - An Unauthorised Companion Steven Paul Davies Boxtree 9780752219684 Unofficial handbook book to the series, including interview material. 2002 The Prisoner - The Official Companion to the TV series Robert Fairclough Simon & Schuster 0743452569 US edition with DVD of official colour companion book to the series. 2002 The Prisoner - The Official Compaion to the TV series Robert Fairclough Carlton 9781842224342 Official colour companion book to the series. 2002 The Prisoner Omnibus Various Carlton 9781842225318 Compilation of three ACE novels (below). 2000 The Prisoner - I am Not a Number Steven Ricks TR7 Publications s/p Production and episode guide booklet to the series. 1999 Many Happy Returns - 21 Years in The Village David Healey Six of One s/p Look back over 21 years of fan conventions. 1999 The Prisoner in Portmeiron Roger Langley Portmeirion s/p In-depth look at the filming of The Prisoner in Portmeirion. 1998 Inside The Prisoner Ian Rakoff Batsford 9780713484137 Memoirs of Living in Harmony author. 1997 Decoding The Prisoner Chris Gregory Uni of Luton Press 9781860205217 Examination of on-screen dialogue and action of The Prisoner. 1997 The Gillis Guide to The Prisoner SJ Gillis SJG 0952844117 Encyclopedia of The Prisoner and its cast and crew. 1995 The Prisoner Alain Carraze / Helene Oswald London Bridge US paperback reprint of French glossy coffee-table episode guide with colour photos. 1995 The Prisoner Alain Carraze / Helene Oswald Barnes and Noble US hardback reprint of French glossy coffee-table episode guide with colour photos. 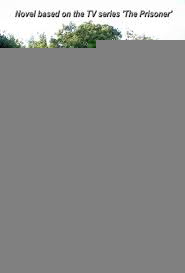 1993 Le Prisonnier Retour au Village Francis Valery DLM s/p French episode guide. 1993 The Prisoner and Danger Man Dave Rogers Boxtree Reprint of large paperback episode guide to both series. 1992 The Prisoner Alain Carraze / Helene Oswald Virgin English paperback edition of French glossy coffee-table episode guide with colour photos. 1992 Le Prisonnier Thomas M Disch Presses French 25th anniversary reprint of novel (below). 1992 The Prisoner - Who is Number Two? David McDaniel Boxtree 01852838303 25th anniversary reprint of novel (below). 1992 The Prisoner - I am Not a Number Thomas M Disch Boxtree 25th anniversary reprint of novel (below). 1992 The Prisoner and Danger Man Dave Rogers Boxtree 01852832606 Large paperback episode guide to both series. 1990 The Prisoner Alain Carraze / Helene Oswald Virgin 01852273380 English hardback edition of French glossy coffee-table episode guide with colour photos. 1990 Charmed Life Roger Langley Escape s/p *** 3rd part of fan-written trilogy of novels. 1989 GURPS The Prisoner David Ladyman Steve Jackson 0155634161 Role-playing gamebook based on the series. 1989 Le Prisonnier Alain Carraze / Helene Oswald Huitieme Art French glossy coffee-table episode guide with colour photos. 1988 The Official Prisoner Companion Matthew White & Jaffer Ali Warner 0446387444 US edition of official series guide. 1988 The Official Prisoner Companion Matthew White & Jaffer Ali Sidgwick & Jackson 028399598 UK edition of official series guide. 1988 The Prisoner John Peel Psi Fi Press 01556981589 Compilation of 5-volume books (below). 1988 Shattered Visage Motter et al DC Comics / Titan 0930289536 Compilation fo 4-part comic book (below). 1988 The Prisoner D Motter et al DC Comics 4th part of comic book series based on The Prisoner. 1988 The Prisoner C Motter et al DC Comics 3rd part of comic book series based on The Prisoner. 1988 The Prisoner B Motter et al DC Comics 2nd part of comic book series based on The Prisoner. 1988 The Prisoner A Motter et al DC Comics 1st part of comic book series based on The Prisoner. 1987 The Village Files -Volume 5 John Peel Psi-Fi Press 01556981031 Episode guide to 3 episodes of the series. 1987 The Village Files -Volume 4 John Peel Psi-Fi Press Episode guide to 3 episodes of the series. 1987 The Village Files -Volume 3 John Peel Psi-Fi Press Episode guide to 3 episodes of the series. 1987 The Village Files -Volume 2 John Peel Psi-Fi Press 01556980043 Episode guide to 4 episodes of the series. 1987 The Village Files -Volume 1 John Peel Psi-Fi Press 01556980051 Episode guide to 4 episodes of the series. 1987 Portmeirion Prisoner Production Max Hora Number Six s/p Reprint of production book (below). 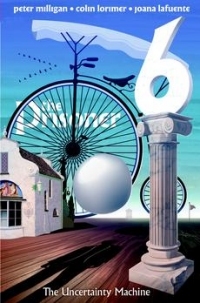 1987 The Prisoner of Portmeirion Max Hora Number Six s/p Updated reprint of guide book (below). 1987 Village World Max Hora Number Six s/p Exploration of locations, episode ordering, and other series facets. 1986 When in Rome Roger Langley Escape s/p*** 2nd part of fan-written trilogy of novels. 1986 Escape Book of Prisoner Episode Reviews Roger Langley Escape s/p*** Scene by scene re-telling with screengrabs of the series' first 9 episodes. 1985 Portmeirion Prisoner Production Max Hora Number Six s/p Examination of the 1966 Portmeirion location shoot. 1985 The Prisoner of Portmeirion Max Hora Number Six s/p Introductory guide to The Prisoner and Portmeirion. 1985 The Making of The Prisoner Roger Langley Escape s/p Paperback fan club booklet looking at the making of the series. 1983 Think Tank Roger Langley Escape s/p*** 1st part of fan-written trilogy of novels. 1983 Changes of Mind Ed. Roger Goodman & Jill Mills Six of One s/p Fan club poetry anthology. 1981 The Village Story Book Volume 2 Various Once Upon a Time s/p Fan club short story anthology, volume 2. 1981 The Prisoner Episode Guide Larry Hall Six of One s/p Fan club paperback episode guide booklet. 1980 The Village Story Book Various Once Upon a Time s/p Fan club short story anthology. 1980 World Gallery Roger Langley Escape s/p Collection of press cuttings related to the series. 1980 The Prisoner 1 Thomas M Disch NEL 0450045439 Reprinted novel (below). 1980 The Prisoner 2 Hank Stine NEL 0450051064 Reprinted novel (below). 1980 The Prisoner - Who Is Number Two? David McDaniel NEL 0450052877 Reprinted novel (below). 1979 The Prisoner Thomas M Disch Dobson 023472059 Hardback reprint of previously available novel. 1979 The Prisoner Hank Stine Dobson 0234721677 Hardback reprint of previously available novel. 1978 The Prisoner Program Guide OCEA s/p Canadian episode guide booklet. 1978 The Prisoner Puzzle OCEA s/p Canadian examination of The Prisoner. 1977 The Prisoner Thomas M Disch Hayakawa Japanese reprint of novel (below). 1970 The Prisoner Hank Stine ACE Novel based on the series. 1969 The Prisoner David McDaniel ACE Novel based on the series. 1969 The Prisoner Thomas M Disch ACE Novel based on the series. This article attempts no distinction between "in-print" and "out-of-print" titles. It would be difficult to constantly keep track of when every book goes out of production. As a result, this list is only to state that a particular title was available at one time, and that it is up to the reader to search out that title for themselves if they are interested in acquiring it, the BUY tabs are not updated regularly so are not a guarantee that books will be available via those links at any one time. Good places to start are Amazon UK or Amazon US. This article should be considered a work-in-progress. Additions, corrections or suggestions are welcomed for any future updates. Feel free to contact The Unmutual Website if you have additional information on the titles listed here. Please include a source with your communication to let TUW know where you found your information, and also if you would like your name to be included in the acknowledgements of any updates. Last updated October 2017. Compiled and maintained by Rick Davy. With thanks to Tom Mayer, Roger Goodman.